Firday is here and if you still don't have a clue where to go tonight to shake that working week off your shoulders, well, I have an idea. 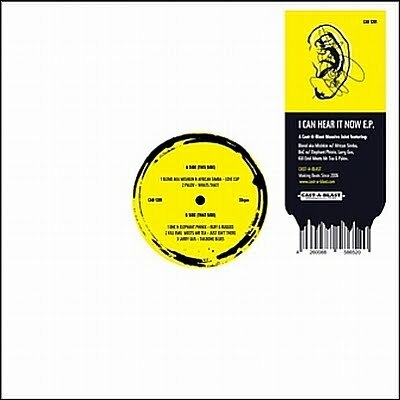 Cast-A-Blast is releasing their latest compilation vinyl I CAN HEAR IT NOW E.P. and they're throwing a party! So, I'll be in downtown Athens, at 6 D.O.G.S. 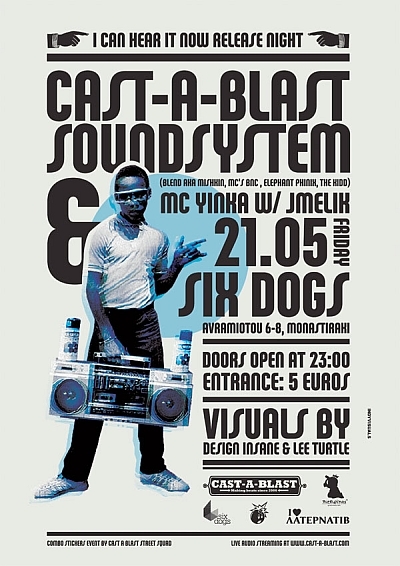 in Monastiraki, listening to beats by DJ Blend a.k.a Mishkin, MCs BNC, The Kidd and Elephant Phinix, DJ Melik and MC Yinka as special guests and visuals by Design Insane and my friend Lee Turtle. CAN HEAR IT NOW E.P. is a compilation of music by the whole Cast-A-Blast crew (Blend aka Mishkin w/ African Simba, BNC w/ Elephant Phinix, Larry Gus, Kill Emil Meets Mr. Tea & Palov) and this is the first time it will be available to buy, after its sneak preview in a limited edition. And if music isn't that much of your thing - after all this IS a fashion blog - the CAB guys have informed me that they will set up a mini Cast-A-Blast shop on site, where their cute t-shirts will also be available. If you really, really, REALLY can't attend, well the whole thing will be streamed live through the Cast-A-Blast website so you can dance to the beats alone in your bedroom. And you can still visit the Cast-A-Blast online shop for all the music releases, as well as some really cute t-shirts. But are you still really sure you don't wanna come tonight? The event starts at 23:00 and the entrance is €5. Facebook event here and google map here.